Since Mac Duff’s departure, Jasmine has been slowly sinking. She’s a fabulous companion for me, but alas I’m wholly unqualified to be a good dog. On walks where we encountered other dogs, Jaz would light up. Clearly, she needs a companion dog. It doesn’t help that most of the sidewalks around here are pretty much buried under ice and snow. That makes it difficult to walk a small dog, especially and old, slightly arthritic one. Hence the search began more than a month ago for a buddy to Jasmine. Happy to say, it looks like I have one lined up. The criteria were fairly straightforward. No large dogs and no nano dogs. 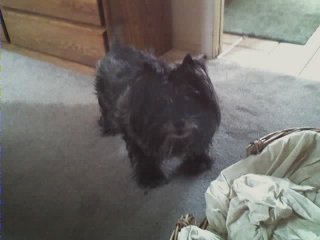 Most of my experience is with terriers so to minimize the learning curve as well as insure the greatest compatibility with Jasmine, my skills and the house/yard configuration, the choice came down to either a Silky terrier, a Cairn terrier or a West Highland terrier. I looked at all the rescue organizations for each of the breeds, but the wait was too long or the expense was too great once travel/transport was factored in. 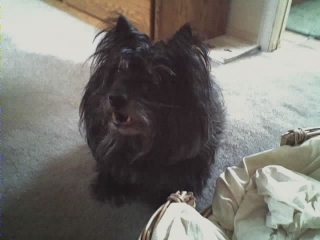 Some of the dogs also had behavior problems which would not have worked with the combination of Jasmine’s age and me not being able to be at the house 24/7. A puppy would be easier to work with in this regard, but they rarely show up on the rescue dog circuit – at least not for the breeds I was looking for. So the next option was to look for a breeder. I looked at quite a few. Some had rather…um….extensive requirements and made adopting a child look like shopping at Wal-Babies. Agree to unannounced visits for the life of the animal? I don’t think so. First right of refusal for the life of the animal if I have to give it up? Nope, not after I paid for air transport. I want breeders to work to place their animals in good homes and I expect some level of checking. But once I’ve been cleared, the deal is done and I start carrying the bills, the breeder should be out of the picture except for any guarantees they may have offered.